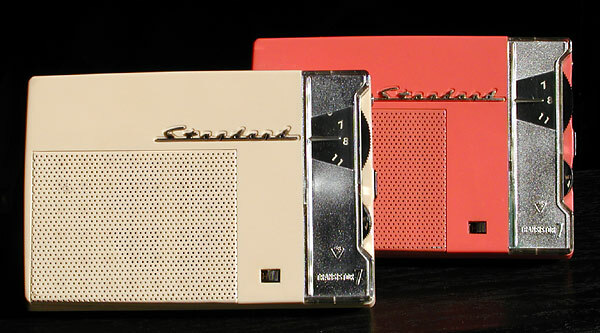 The SR-G24 is a 7-transistor horizontal "book style" coat-pocket radio that may be slightly on the large side but is ultra-slim and bears itself with a sophisticated air. 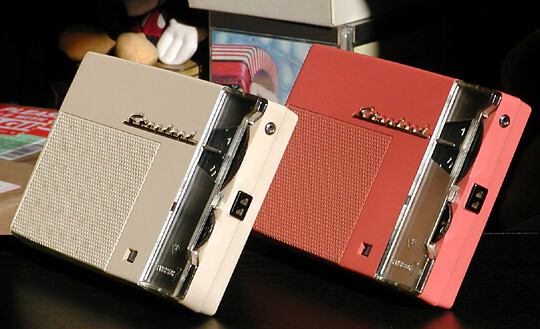 The grille covering the large 3" speaker is painted to match the cabinet colour, the silver escutcheon on the right is reverse painted; and the radio sports the same metal name plate that looks like something off a neat vintage car. This badge is found elsewhere only on the company's earliest models, including the SR-F21, SR-F31 and SR-G34. The SR-G24 went on sale in the spring of 1958. Some time in early 1959 the model was revised, rationalized and re-released as the SR-G24A . But more on the changes as we go. The photo above gives us a look at not only how slim the radio is, but also at the external antenna jack and twin earphone jacks on the side that are common to both the SR-G24 and SR-G24A.